Châtaigne Oak Farm est un luxueux lodge retraite de style occidental sur une ferme équestre de 90 acres près de la base de Old Rag Mountain. Le lodge a été construit en 2009 en utilisant des blocs de granit de la ferme et d'énormes billes de pin de Virginie dans un style occidental de l'élégance rustique. Le lodge est entouré de terrasses et vérandas pour profiter de la vue magnifique sur Hidden Valley, Old Rag Mountain, étangs jumeaux de la ferme, et les chevaux qui paissent dans les champs. Le lodge est équipé de cuisine d'un chef, grande salle à manger (nous avons assis seize ans), cheminée double face, grand piano, véranda et porche couvert. La maison principale de lodge dispose de trois chambres de maître, et deux autres grandes chambres avec une salle de bain partagée. En bas une salle de jeux avec baby-foot débrayage, ping-pong, un bar et une fosse foyer / film avec 52 'TV écran. Le bain à remous 8 personne extérieure est à quelques pas, avec vue sur l'étang. 150 pieds en bas de la colline au-dessous de l'étang est le «Guest» Treehouse. Le Treehouse est un cèdre dégrossi deux maisons de style cabine niveau qui peut accueillir six personnes, avec salle de bain complète et cuisine - et une sortie de pôle de feu en option pour les plus aventureux. Cette aerie treetop doit être vu pour être cru! La ferme a un petit troupeau de chevaux et un alpaga, Mike. Nous avons des sentiers de randonnée sur la propriété. Un réseau fantastique de deux ventilateurs de gravier et de routes pavées hors de la ferme pour les routes incroyables cyclistes court et à long éloignés. Ou vous pouvez quitter la ferme de la randonnée dans les sentiers locaux incroyables ou des poissons des cours d'eau locaux, ou visiter certains des vignobles locaux ou les fermes biologiques. Nous sommes à 35 milles de Charlottesville et à 82 milles de Washington DC. Concierges vivent sur place et peuvent aider avec des questions, du bois de chauffage, les directions, et même avec le provisionnement si désiré. Ils sont heureux d'organiser spectaculaires sentiers promenades guidées sur mesure à partir d'un local stable dans les montagnes environnantes - même des voyages de camping durant la nuit. Grange avec 4 boxes, sellerie, grenier à foin et de mur d'escalade intérieur. Les jardins potagers, petit ruisseau, beaucoup de possibilités de randonnée situés sur la propriété. Our trip was a group of dads looking for time away. It's hard to find a decent rental for large groups in the area that is actually set up well for a large group. The house was perfect. Responsive owner. Fantastic views off the front porch. Plenty of room for everyone to spread out and have their own space. The kitchen was great for feeding a large group. This place is the real deal. We'd definitely come back. We absolutely loved his beautiful house. It is both roomy and airy and cozy at the same time. It had more than enough room for our 10-person party. The views from nearly every room are spectacular. Beatifil house, idyllic location, great host. Extrmely well appointed main house, as advertised. The farm house met our high expectations as based on the previous reviews. We had lovely week for extended family over Christmas. So glad you could visit over the holidays this year. The house does have a special holiday vibe, even without snow! Hope you can visit us again! 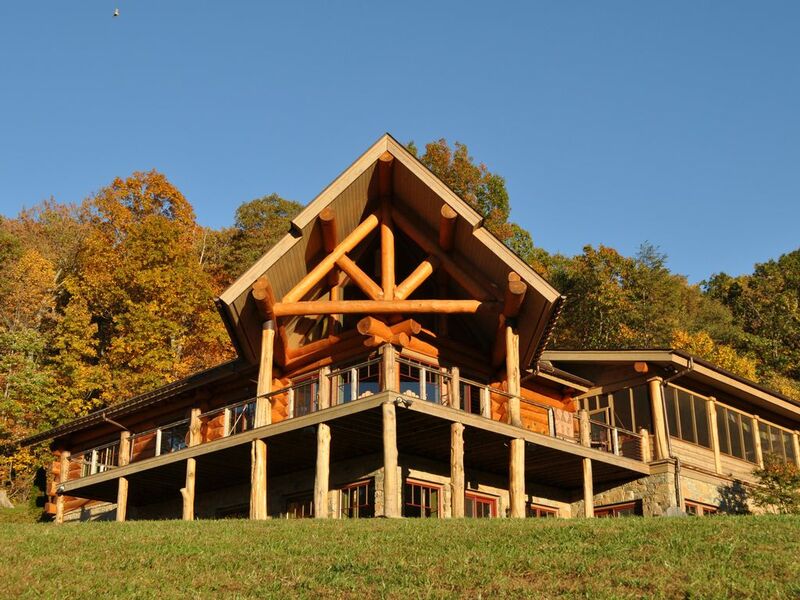 A Wyoming luxury cabin right here in Virginia! WOW! This property was better than we could have ever expected. It is MUCH nicer than the photos portray. There were 14 adults in our group and we stayed November 1-4, 2018. 5 of the 14 stayed in the treehouse. You feel like you are pulling up to a Wyoming resort when you get to the door. Walking inside is stunning! The beams, wood, stone & other natural materials are simply gorgeous. Let me start by saying that I highly recommend taking a few moments to read through the welcome manual. It tells you every possible thing you will need to know. There do have Wi-Fi, but there is NO cell phone service. You can make calls through Wi-Fi apps though & there is a landline. The kitchen has everything you could possibly need to cook a 5 course meal! The double oven & 2 dish washers were fantastic since we had group meals every day except one night that we went to HeadMasters Pub for dinner, pinball & games. Fun place! I also recommend checking out DuCard Winery which is lovely & has really good wine. The home is very well designed in that there are places for everyone... little nooks for reading & quiet time to just look out the window at the amazing view, big screen TV in a sunken pit downstairs for the men to watch the football game or a movie, the main living room for fellowship time together & a HUGE hang out and talk to whoever is cooking, gourmet kitchen. The wrap around porch & screen porch were heaven for coffee & wine time with a view that is pretty spectacular. I spent A LOT of time just staring out into the mountains. I feel bad for Mike, the alpaca. He looks so lost & lonely ever since his companion, Ike, died. Although I wonder if he is starting to think he is really a horse! The day we arrived it was raining & unusually cold. As we were driving up from Richmond which is a 2 hour trip, I received a phone call from the home owner. Richard was kind enough to call me personally to check on our driving conditions & let me know that there was ice & that the road onto the property would be slick; however, he was going to have someone come & run the tractor to break up the ice into the gravel so it wouldn't be as bad. Within minutes of arriving we met Danny who was taking care of that. There were just a couple of things that could be modified or added which I suggested to Richard & he has already let me know that they are being addressed. I can't say enough about how beautiful this home is & how accommodating the owner and his caretakers are. Even More Beautiful than the Pictures! As amazing as this property appears in the photos, it is even more beautiful in person! The home itself, and treehouse, are enormous, lovely, and fully equipped with everything you need for your stay. And the valley that the property overlooks, with mountains in the background, were probably the nicest views in the Shenandoah region that we've experienced in 14 years. We highly recommend this property! Situé à une courte distance de Old Rag Mountain, de White Oak Canyon et de Skyline Drive à Blue Ridge Parkway, cet endroit est idéal pour ceux qui recherchent une retraite confortable entourée par la nature.